Booyah occupies a retail storefront on Vaughan Road just a few doors down from Dutch Dreams, and it couldn’t be more different from its neighbour. Ice cream is all the rage in Toronto this summer. From tacos to sandwiches to tricked out cones to small batch creations in interesting flavours, there’s plenty to indulge in if you’re craving a frozen treat. 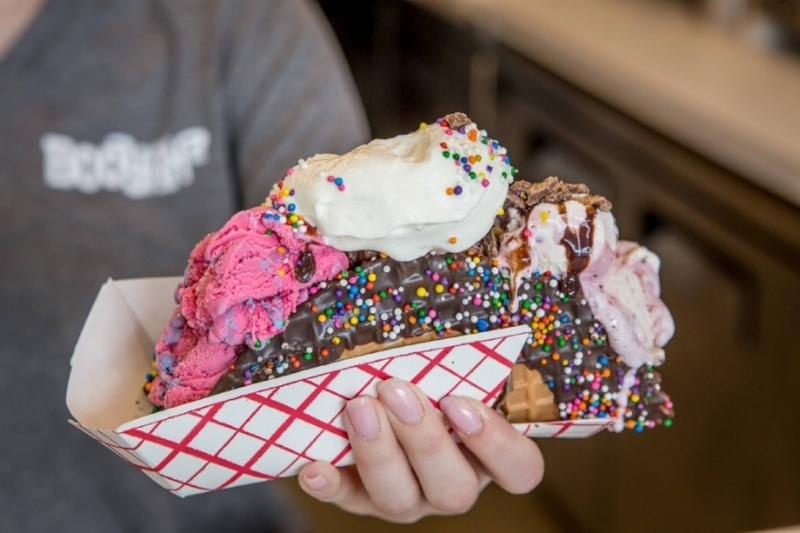 Ever dreamed of a concoction in which you could shovel a handful of ice cream into your mouth with ease? Booyah has you covered. St. Clair West residents can’t get enough of the homemade ice cream sandwiches (made with your choice of four flavours of vegan cookies and multiple flavours of hard or soft vegan ice cream) at Booyah Inc.
"There’s nothing quite like ice cream paired with warm pastry. " Isabelle is a freelance stylist, photographer, and digital content creator specializing in food, product, and lifestyle reviews Booyah Inc.
"This Is The Insane Ice Cream Taco Spot In Toronto You Need To Try ASAP"
Narcity talks about some of the items we have that makes Booyah a must try!